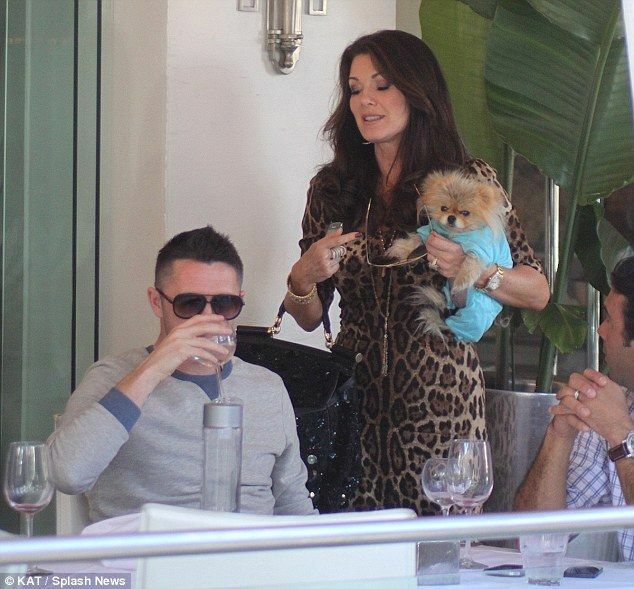 Robbie Keane pictured at the restaurant owned by Lisa Vanderpump. Irish soccer star Robbie Keane dumped his English team for the Los Angeles Galaxy a few years back, and he’s been spotted with a number of celebs during his time in Tinseltown. Does Real Housewives of Beverly Hills star Lisa Vanderpump actually count as a star? Keane ate at her restaurant last week and didn’t look too impressed, as you can see from our picture, but that didn’t stop the reality fixture from stopping by his table with her dog to make sure Keane was okay. Now that Galaxy teammate David Beckham has taken off for Paris, Keane will have more of the limelight aimed in his direction. But the native Dubliner says he’s not aiming to be a matinee idol like Beckham. “With my Irish skin, I don’t think so. People might get a fright at how white I am,” he said. Keane’s glamorous blond wife Claudine was delayed making it back to LA because of sickness, but her husband wasn’t lacking for company. “Didn’t fly back to LA yesterday as little Robert and I have the flu. The one time I cancelled a flight and Rob is sitting beside Brad Pitt! !” she tweeted.